Craig Luebben, 49, an experienced climber, climbing author, and climbing guide from Fort Collins, Colorado was killed yesterday, August 9, after been hit by falling ice on 8,120-foot Mount Torment in Washington’s Cascade Range. Craig, a friend and fellow author for FalconGuides, was climbing with Willie Benagas in preparation for an American Mountain Guide Association (AMGA) test for their coveted Alpine Guide certification. After the accident, Benagas was able to call rescuers who picked the pair up by helicopter yesterday afternoon. 2009 has been a rough year for deaths in the climbing community to say the least. Our thoughts are with Craig’s friends and family. Climbing has lost a great friend and mentor: Craig Luebben. Luebben, inventor of the big bro and author of numerous climbing guides and how-to books, has died. 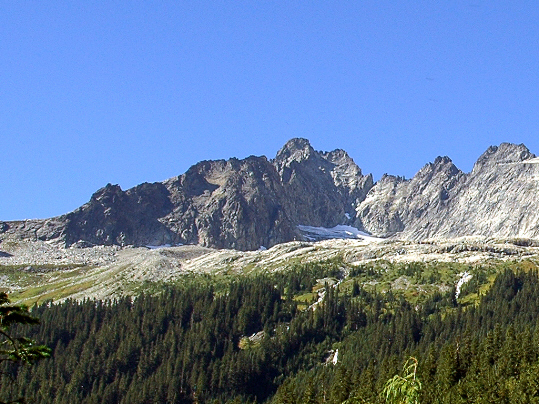 He was fatally struck by icefall while climbing in the cascades. Though a rockstar in his day, Luebben will — and should — be most remembered for his penmanship. From basic movement to complex anchors (a favorite of his), Luebben’s books have taught safe and technically sound climbing techniques to myself and thousands of others. I remember discovering Luebben’s Mountaineers Press how-to books. I was working at the summit hut, a gear store in Tucson, Az, when I noticed two new additions to the climbing shelf (I had them practically memorized!). As I leafed through the books, I was instantly impressed by their organization and level of detail, especially the clear and detailed pictures. In the ten minutes I studied those images, I learned techniques that have made climbing experiences more enjoyable and, most importantly, safer. Luebben wrote, I believe, out of altruism for a sport he loved. With his climbing experiences and writing gifts, Luebben could have penned a lucrative bestseller. Instead, he wrote pieces unfamiliar to most, but cherished by a few. 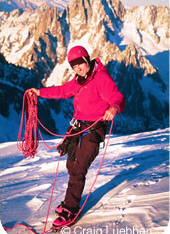 Luebben wrote trusty climbing guides, authoritative instructional books, and gripping articles in climbing publications. Luebben chose to dedicate his innumerable gifts to the sport he loved and those that shared his passion. For we have all benefitted and our deeply grateful. Rest in peace, Mr. Luebben. Man, I’m sick to my stomach!!! I just found out about Craig’s accident. This is beyond belief, as he was a friend, professional, a real PERSON, and just as down to earth as one can get! My very humble condolences goes out to Silvia and Giulia, as I know how dearly he loved his daughter, and talked about how good she was doing in skiing and how proud he was. God Bless you Silvia and Giulia during this terrible time, our friend will be missed. In the early 90’s my son and I spent a weekend with Craig climbing Mt. Katahdin. It is a memory that my son and I will always cherish. Craig was an outstanding teacher, climber, photographer and wonderful guy to spend time with. An honor to have known him, however briefly and our condolences to his family. He spoke so lovingly about his wife.